Pink branding to show our love! June 23rd is National Pink Day according to the National Day Calendar! Of course, the team at Sugar Fix Dental Loft did not need any other reason to celebrate this day and our favorite color! We adore all things pink and love to show it off all the time, both around the office and at home! Our patients are very aware that we love to add some fun to our products and our brand with the color pink. Everything from the sign hanging outside our office to the lip balm we hand out at dental check-up appointments exudes pink. Even our pens and hand sanitizer bottles are pink! It’s very fun and fitting to have this shade be such a huge part of our brand. 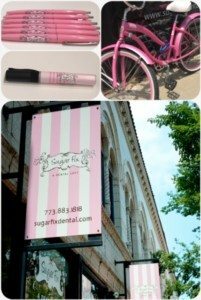 You might be wondering why the color pink is so prominent in all things Sugar Fix… Well, not only was it Dr. Jessica Emery’s favorite color when she opened the practice nearly 10 years ago, but it is also a hue that has many representations including compassion, beauty, and hope. Finding a healthcare professional who expresses true compassion and sincerity can be challenging, but Dr. Jessica Emery does just that for each of her guests! Don’t you think the Sugar Fix logo makes complete sense?! Beauty is one of our favorite elements associated with this fun, flirty shade. Not only do we offer routine visits at our Lakeview practice, but cosmetic dentistry (including veneers, porcelain crowns, and Invisalign) is the number one reason why Dr. Emery is the best Chicago dentist! Here are some other fun facts about the color pink… Did you know that boys originally wore pink clothes, as it was seen as a strong color, while blue was considered to be more delicate? How about the fact that flamingos are pink due to their diet? Interesting stuff, right?! Our office strives to make each and every one of our guests feel that we care for them as if they were family. It is our goal at Sugar Fix Dental Loft to achieve optimum patient happiness and satisfaction. That is what the color pink means to us, and this week we celebrate it completely. Happy Pink Day! Be sure to spread the Sugar Fix love and follow us on Facebook, Instagram, and Snapchat (@drjessicaemery)!